I don't think so. Artists have been secretly sketching people forever. It's just that using an iPhone is particularly invisible as it looks like you are just checking your emails or playing a video game or or or. I love drawing people and have ample opportunity when I travel the Caltrain route from Mountain View to the City of San Francisco. Trains are frequently late in Silicon Valley, so I get to draw on the station too - all the hunched up figures checking their devices. Or how about the coffee shop where I spied this lady on the next table and had to sketch her (above. Sketching for me is warm up time and also where I get my ideas and inspiration. Sometimes they work, often not. No worries. Sometimes if I like the sketch Ill show the subject and text it to them. Seems only fair. Favorite apps for people sketching? Well Paper 53 is always a huge favorite for me, particularly the roller tool which is like a vector tool (but not). But I also love Art Rage using the pencil for sketching purposes as above. Then there is Procreate, bit harder to use on the fly as I tend to paint with it using layers, so it's more of a challenge. But I've been happy with the results. 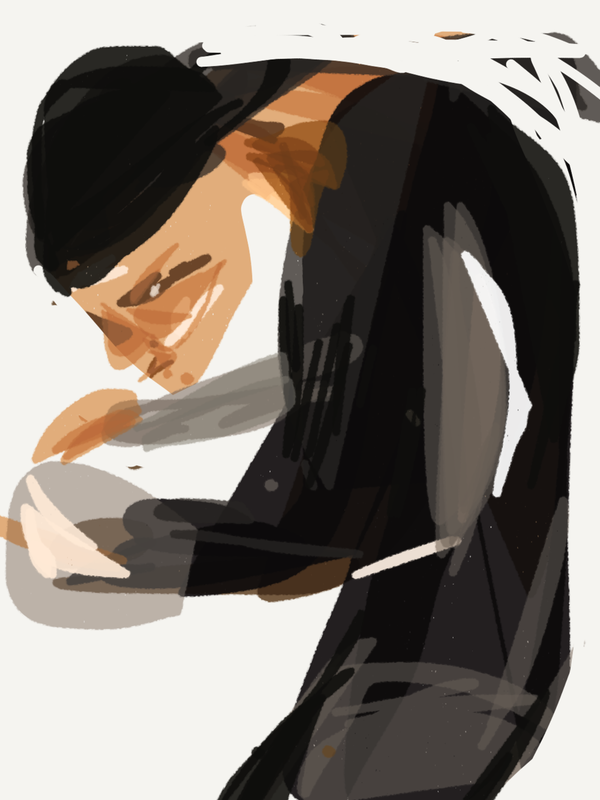 I actually met one of our Mobile Art Academy associates, John Hayes while while both of us were sketching on the train. John is a very talented character designer for a big gaming company in San Mateo, and an android tablet user, and you will soon see some classes from him on his favorite app Infinite Painter. Anyway, these are just some thoughts on the joy of using your iPhone to sketch people without them spotting you!